The Ansat is a light multi-purpose helicopter equally suited to civilian, military and medical use. With an average cost $1-1.5 million cheaper than its nearest equivalent, the flexible helicopter has already sparked interest abroad and has the potential to become hot property on international markets. Russia’s major helicopter exhibition, HeliRussia, was held on May 22-24. The event is an opportunity for domestic manufacturers to showcase already popular models as well as the newest designs, many of which have not yet entered mass production. Among the legendary veterans Mi-8 and Mi-24, ultra-modern models like the Ka-62, and the powerful Mi-28 and Ka-52 gunships, it is easy to overlook a small helicopter, one which nevertheless has every chance of becoming an international bestseller. The idea to create a light helicopter was prompted by the notable absence of this type of aircraft in lines produced by Russian manufacturers. Its designers were inspired by Russia’s most successful helicopter model (accounting for up to 70 percent of exports), the Mi-8 (Mi-17), which is popularly known as “the Kalashnikov among helicopters” for its simplicity and ease of maintenance. Hence the name for this younger brother to the Mi-8: Ansat is translated from the Tatar language as “simple”. The name is Tatar because the helicopter is manufactured at the Kazan helicopter plant in the Republic of Tatarstan. Originally, the Ansat was designed to outperform its equivalents in terms of flight and technical characteristics, as it had to fight for its place in a market in which Russian companies had not yet established themselves. 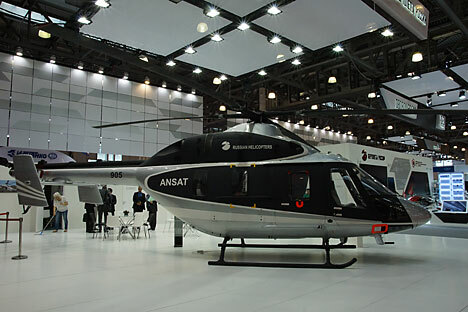 With an average cost $1-1.5 million cheaper than its nearest equivalent, Eurocopter’s ЕС-145, Ansat has not only fully identical characteristics but also a more spacious cockpit, which can be adjusted to specific customers’ needs. This is what qualifies it for the title “multi-purpose”. Depending on their configuration, Ansat helicopters can be either passenger, transport, ambulance, or rescue. In addition, the Russian military already use them for training and patrol purposes. The story of the new helicopter has not been an easy one. It had its maiden flight back in 1999 but received a certificate authorizing its commercial use only in August last year. The problem, strange as it may seem, was that some of the technological solutions used in the Ansat were ahead of the relevant regulations. It was the first helicopter to use a fly-by-wire (FBW) system, which before then had only been used by modern warplanes and passenger jets. FBW systems make it possible to considerably improve an aircraft’s characteristics by reducing its weight, costs and making it easier to operate. Russian officials could not certify the helicopter for commercial use because they did not know which criteria to use for testing a fly-by-wire helicopter. As a result, the Kazan plant had to revert to using conventional manual flight controls. It was only after that that the necessary papers were issued. However, for the Russian military, rescue and other services, a commercial operation certificate was irrelevant and they became the first to try the new helicopter in action, all the more since the Mi-2 models that were used to train pilots had already become obsolete. In 2013, the first six Ansat-U helicopters were handed over to the Air Force Academy to train future pilots. Overall, as part of the state armaments program, the Russian military are due to purchase 40 Ansat-U helicopters by 2018. The manufacturer is now considering the options for selling the helicopter to civilian operators, including those abroad. The chief designer of the Kazan helicopter plant, Oleg Garipov, is confident that market success and the global reach of the Russian Mi-8 helicopter will help promote Ansat too. “The Kazan helicopter plant took a conscientious decision to diversify our production. The Mi-8 is a legend, ‘the Kalashnikov assault rifle’ of aviation and aircraft manufacturing, but one has to develop further. The management identified the niche of light multi-purpose helicopters as the most promising one. All helicopter companies are represented in this segment and there is fierce competition there. This is one of the most popular niches on the market,” Garipov told Russian media. It is through building on the reputation of the Mi-8 that the Ansat has managed to secure positions for itself in Africa. During Russian President Vladimir Putin’s visit to the BRICS summit in South Africa in March last year, an agreement was reached on the possible joint production of Ansats. At the time, Russian Industry and Trade Minister Denis Manturov announced that the Mozambique presidential administration had shown an interest in acquiring the new Russian helicopter for its air fleet. The helicopter’s success will depend on whether it will manage to become a mini version of the Mi-8: cheap, easy to maintain, and reliable. Assessing the helicopter’s immediate prospects, head of research at Aviaport agency Oleg Panteleyev said: “To begin with, state contracts will be enough. Private companies will be watching how the helicopter proves itself in operation.” We shall very soon learn whether Ansat becomes a bestseller or not.